Canada’s Véronik Mallet performs her long program at 2014 Skate Canada. Canada’s Véronik Mallet had a bumpy season last year, beginning with her ISU Challenger Series at 2014 Nebelhorn Trophy where she finished seventh. She then finished 10th at both her Grand Prix events in Canada and France. 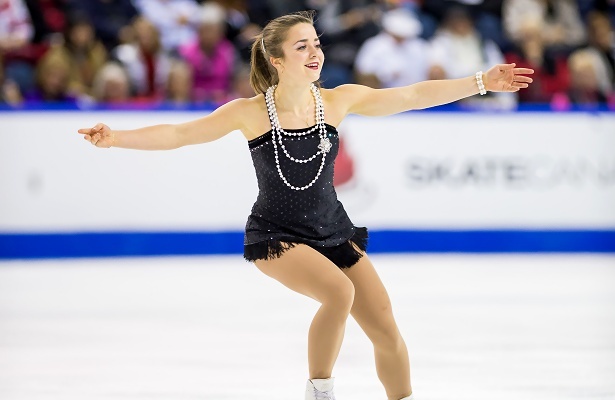 Her goal at the 2015 Canadian Tire National Skating Championships was to make the podium, and she did it. The skater placed second in the short program, and third in the long and overall. “I did my best scores in both programs and I felt very confident at that point in of the year,” said Mallet, who later finished 14th at the 2015 Four Continents Championships. The skater currently trains at the Champions Training Center in Contrecoeur, Que., under Annie Barabé, Maximin Cïoa and Sophie Richard. Next year, the Quebecoise plans to change rinks and will train in Varennes, which is approximately 35 minutes from Contrecoeur. The skater began the 2015-16 season with a summer competition in Philadelphia, Penn., but withdrew from the Quebec Summer Championships due to a minor ankle injury which happened a week prior to the event. She is currently competing at the 2015 U.S. Figure Skating Classic which are taking place this week in Salt Lake City, Utah. The skater will be keeping her short program to Chopin’s “Waltz No. 7” from last season, however, her new long program is to “Allegro molto appassionato” from Mendelssohn’s “Violin Concerto in E minor, Op. 64.” Both routines were choreographed by David Wilson. Mallet, who is currently studying Human Science at CEGEP in Sorel-Tracy, Que., would like to eventually become a professor at a primary school. She would also like to be a figure skating coach.